Anna Carey grew up on Long Island, the daughter of a special education teacher and an astronomer. Early on she talked of being a painter, district attorney, flutist, physical therapist, or graphic designer, but eventually pursued writing — the one thing that allowed her to be all of the above. She studied Literature and Creative Writing at NYU, and took part in her fair share of snowball fights in Washington Square Park. After college, she worked as an editor in children’s publishing before getting a Masters in Fiction from Brooklyn College. She now lives in Los Angeles, where the apartments are bigger and the weather is sunnier, but she still misses New York. Learn more at Anna Carey’s website. CLICK HERE FOR MORE BY ANNA CAREY. 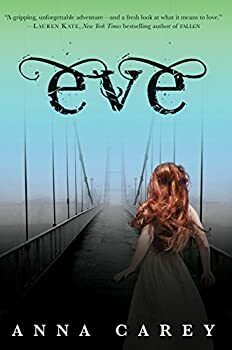 Eve — (2011-2013) Publisher: Where do you go when nowhere is safe? After a deadly virus wiped out most of Earth’s population, the world is a terrifying place. Eighteen-year-old Eve has never been beyond the heavily guarded perimeter of her school, where she and two hundred other orphaned girls have been promised a bright future in The New America. But the night before graduation, Eve learns the shocking truth about her school’s real purpose — and the horrifying fate that awaits her. Fleeing the only home she’s ever known, Eve sets off on a long, treacherous journey, searching for a place she can survive. Along the way she encounters Caleb, a rough, rebellious boy living in the wild. Caleb slowly wins her trust . . . and her heart. But when soldiers begin hunting them, Eve must choose between true love and her life.